As a former owner of Blue Ribbon Flies, I’ve spent considerable time helping people prepare for their trips to Yellowstone. This includes discussing seasonal opportunities, arranging for guides, suggesting which rivers to fish and when, explaining hatches, selecting flies, and passing along any other tips that will help make for an enjoyable trip. I still do this today, though on a part-time basis. In fact, my co-workers at Blue Ribbon Flies and I do everything we can except the most important thing: casting your fly. Ask fishing guides anywhere in the world what skill they’d most like their clients to have and their answer will be universal: good casting ability. Nothing else is even remotely as important. Poor casting hurts in two ways. When being guided, it limits the options as to where you can be taken; some waters simply require a minimum level of casting proficiency for success. Second, whether fishing with a guide or on your own, an inability to cast limits the techniques which you can profitably employ. Though many guides are outstanding teachers, most will concur that the place for learning to cast is at a practice field, where fishing can’t get in the way. To really learn to cast well, proper instruction is as essential as adequate practice. 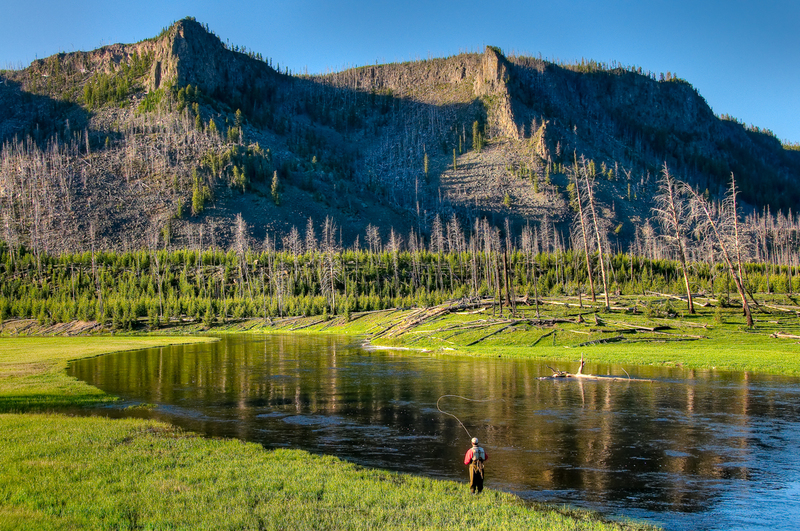 Fly fishing is an interesting sport in that it’s generally treated differently than, say, golf or tennis, where most participants use lessons to further their enjoyment of the game. Yet fishing isn’t any different; the better you are, the more fun it becomes. Unlike golf or tennis—both difficult sports—the fly casting stroke is relatively simple and easy to learn. Nonetheless, it must still be learned. In thirty-plus years of teaching, I can count on one hand the number of fishermen I’ve seen whose casting strokes could not be improved by professional help. Most of us are never taught proper casting fundamentals. But once you know them—and in the space of a one hour lesson you will learn them—your casting will be forever changed, for the better. I offer casting lessons for $100.00/hour. These are one-on-one sessions in which you’ll have my full attention. To avoid taking time away from your fishing I like to schedule lessons early in the day or mid-late afternoon (but of course will work around your schedule). Improving your casting is actually a lot of fun, and virtually every student I’ve taught can’t believe how quickly their hour with me flies by. Your future fishing experiences will be all the more rewarding for it. To make arrangements, you may contact me via this website or call me directly at 406-646-9018. I also offer a gift certificate for casting lessons, which makes a great present for that hard-to-buy-for angler. Order one by clicking the gift certificate link under the “Purchase” header at the top of the page.